Posted July 24, 2017 by Diane & filed under Book Recommendations. There is a wealth of medieval-themed books for young readers out in the world. In this series of posts, I’m sharing some of my favorites for readers who might be interested in learning more about this world that fascinates me so much. These recommendations include works about northern Europe, which is where my own research has led me (it’s also been challenging to find texts for young readers that explore other geographic areas during the medieval period). I won’t include many books that have a heavy reliance on magic in this list, unless it’s as much a historical as fantasy with clear links to the real medieval world. And we start with one such book: Adam Gidwitz’s The Inquisitor’s Tale. 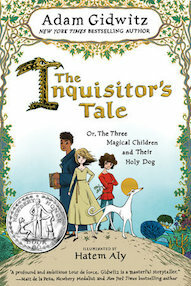 This immaculately researched story follows three magical children in medieval France. Jeanne, who has had visions and owns a holy dog that has come back to life, is fleeing soldiers tasked with burning her at the stake. The oblate William, the child of an African Muslim woman and a Christian crusader, is expelled from his monastery and traveling to a new one in Saint-Denis. Jacob, a Jewish boy, escapes his burned village and goes in search of his cousin in Saint-Denis. The three meet up and together flee from the soldiers toward their common destination: Saint-Denis. But once there, their escape turns into a quest to save holy texts. A final confrontation at Mont Saint-Michel shows that kindness has the power of any miracle. This book is especially notable for the three main characters’ ethnic, religious, and racial diversity. It will appeal to readers who loved Gidwitz’s A Tale Dark and Grimm, those simply eager to learn about medieval society, and those keen on a wildly funny and engaging story.